Standoff 2 – Call of Duty or Counter-Strike has long been a legend in FPS shooter genre. Players will participate in dramatic gunfight minutes on the battlefield with numerous other warriors in the same system. Thanks to the healthy development of the community of players from these legendary games, has become an inspiration for the birth of other games. Although born later, but the “juniors” affirmed that they also have no less attractive, and one of those proofs is Standoff 2. This game has a predecessor version of Standoff 1 and developed by Axlebolt. With over 10 million installments, along with nearly 700 thousand ratings, this game achieved 4.5 / 5 rating points and rose to the most attractive FPS shooting games on the app market. Right now, we will go into finding out how to play Standoff 2. 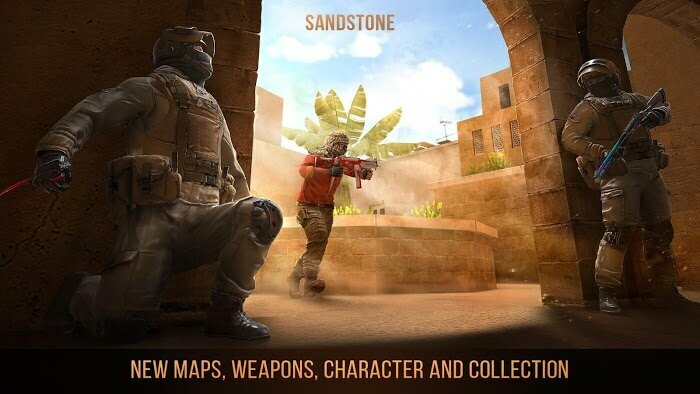 As introduced, Standoff 2 is an FPS shooting game, where you will become a real soldier and be responsible for destroying enemies on the battlefield. This game has three familiar game modes: Deathmatch, Defuse the bomb and Arms race. 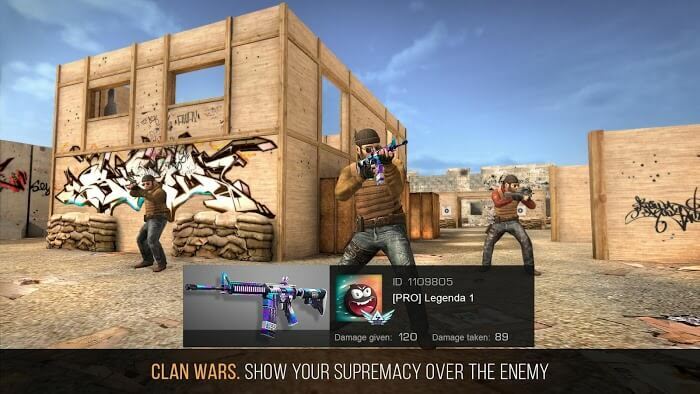 Each style has a different play mechanism, for example, matches in Deathmatch will take place for a certain time, members of a team will attack the enemy to score points, and when the time is up, Any team with more points will win. Meanwhile, Defuse the bomb will take the dynamites and install them in the areas, and the police must either remove the bombs or destroy all the bandits to win. However, no matter what mode the players get in, they need to have quick reflexes, along with the ability to control the character and judge the situation in an agile manner to win. Moreover, Standoff 2 values teamwork, players in the same team must have proper attack tactics and support each other during the battle. The system provides online chat via phone microphones, and players in a team can talk to each other. Weapons are an item that players can not lack on the battlefield, and they have powerful firepower, help you damage enemies. The system provides you with hundreds of weapons, from main weapons, secondary weapons, melee weapons, and other powerful bombs. 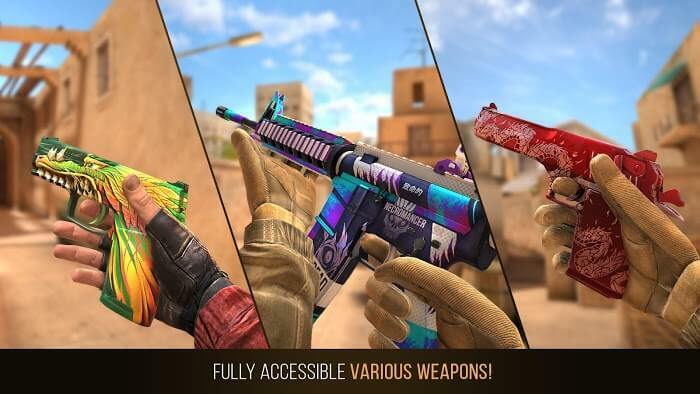 Some of the primary weapons stand out as Treasure Hunter, Railgun, Winged, CyberPunk,… Types of pistols: Neon, Nest and melee: Blue Blood, Dragon, Universe, Ancient, … Each weapon All with eye-catching designs will make you feel like it at first sight. However, you will have to go through difficult tasks or spend big sums to get them. The Standoff has impressive 3D graphics. You will have the same feeling as being in a real battlefield by the scene that the designer pays attention to every little detail. Along with that, how to shape characters, effects of physical motion, or sound light also use the most advanced technology, with a high level of authenticity, making it as immersed in it. Game’s time, and choking in intense battles. 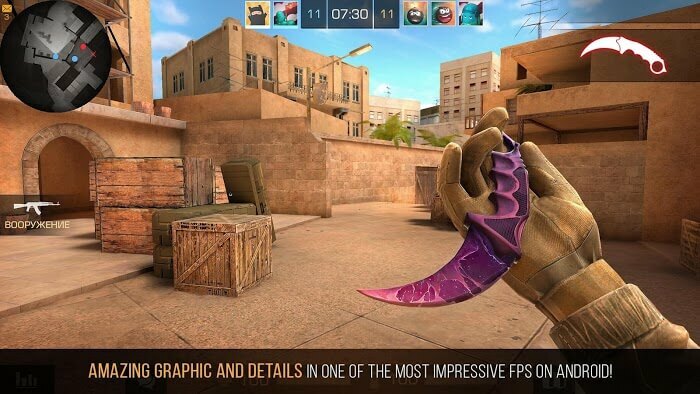 Any mobile gamer can’t ignore excellent gameplay and graphics like Standoff. Download this game and join the top battle with your teammates now!